"La Vie Magnifique De Charlie" (The Magnificent Life of Charlie), is an exciting tale of a young girl who is adjusting to the untimely passing of her sister in an unorthodox way. The story follows an energetic, quirky girl named Charlie and a group of her friends as they go on a series of adventurous tasks left as a final message from late sister, Brandy. The movie explores the experiences and interpersonal relationships of sisterhood and the portrayal of black women. DIVDOM ENT. GROUP CASTS & CO-PRODUCES THE NEW EDITION FAN MADE TRAILER - "N.E. HEARTBREAK THE MOVIE"! In 2015 Bobby Huntley Films, in conjunction with Divadom Entertainment Group, set out on a journey to create a fan made trailer, with hopes of producing their story on a larger scale. This concept teaser was created as a labor of love with no budget. Just hard work, creativity and a love for New Edition and their legacy. ATLANTA LOVES "LITTLE BLACK GIRL'S BLUES"
Set in 1927 and advancing forward ten years into 1937, spins a musical tale of a young teen girl, Jewel Jamison, living in the small and deeply religious town of Burgaw, NC, who has big dreams of becoming a famous Blues singer. However, after her father abandons the family, Jewel turns to her best friend and musical confidant, Lucas Lattimore, for comfort; resulting in a situation, that causes Jewel to be sent to live in Chicago with family members. After the sudden dissappearance of Lucas and spending the next 10 years Jewel cleaning the house of prominent club proprietor, Paul “Slim” Pickens, owner of the Black Swan Room; By chance, Jewel is discovered and given a chance to live out her dream. In the meantime, unbeknownst to Jewel, Lucas has not been far behind and in a twist of fate, the blessings of their dreams might be the source of her BLUES! potential of their roles. I loved it and I would love to see it again. 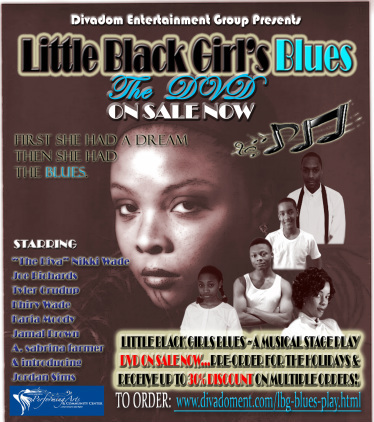 I attended Little Black Girls Blues on Saturday June 04, 2011 8:pm. I thoroughly enjoyed every minute of the play. Having attended many plays around the Atlanta area, over the years, this was truly a good time. For her first shot out of the box Ms. (Hunter)Wade did a great writing job, along with her acting. It was a snazzy, kinetic, hot and hilarious... must see. It’s a great tribute to the toe-tapping song and dance era of the 1930’s, with a cast of phenomenally skillfull singers and actors. If anyone is a fan of the music and sound of the Harlem renaissance, you won’t want to miss it if it comes back! Went on Saturday night and thought it was just GREAT! It was a very professional production and had a great story. attend as well as make others aware of your talent. I attended your play last night... and I wanted to tell you last night that I thought you did a wonderful job! You are amazing. Your cast was amazing. I loved your production and hope that millions get to see it soon. Thank you for inspiring me. I now have a new hero! Thanks for creating a wonderful experience! producer(s) and cast member for a performance well done!